How many Christmas parties have you been to so far this year? How many have you got coming up? So far I've been to one and had a pre Christmas work nights out. 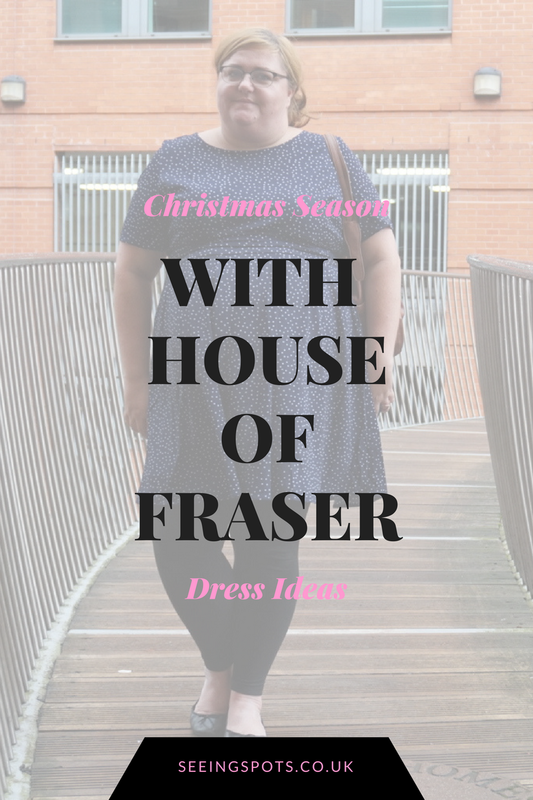 It can be hard to decide what to wear and luckily House of Fraser got in contact and asked if I'd like to review one of their dresses with the festive season in mind. My main Christmas do is straight after work at 6pm and I decided to think along the lines of something I could wear to the office then with a change of accessories and footwear dress up for the party. I am always really impressed with House of Fraser's range of party dresses and the range of sizes they stock. The website is also really easy to navigate and I've noticed there is quite a few dresses reduced, including the one I've chosen. I do love a bargain. 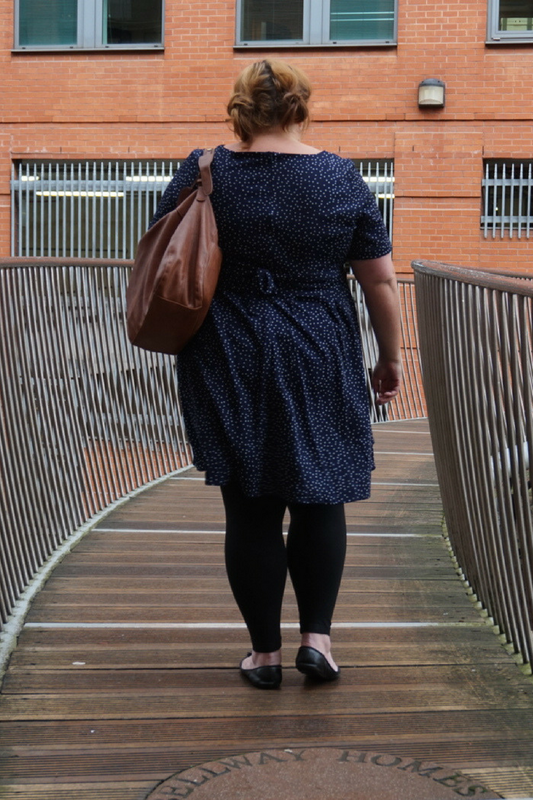 I decided to go for this Yumi Curves short sleeved spotted dress, it's a good office wear dress and works well for the party season. My wardrobe used to be full of spotty items (Did the blog name give that away?) but over the recent months I've notice a decline in the number of spotted items and this is the perfect addition to my wardrobe. I wore this to my teams pre-Christmas night out where we played mini golf and went for a meal at Pizza express. It was comfy to wear all day in the office and didn't restrict me when we played mini golf. I even scored a hole in one! Go me! Yumi Curves isn't a brand I'm familiar with and decided to size up to a 24 and it is slightly big on me but I much prefer that, especially when I know I'm going to be going out for food as well. I'll be on the look out for other items from this brand as I'm really impressed with the style and quality of the dress. The dress is two layers, with a lining and the main dress layer which has a good weight to it and doesn't seem to be see through. It also has a really long, slightly too long attached at the sides belt. (Is there a technical term for this kind of belt?) I've crossed it over at the front before doing the bow at the back. I'm also really loving this length of sleeve at the moment. 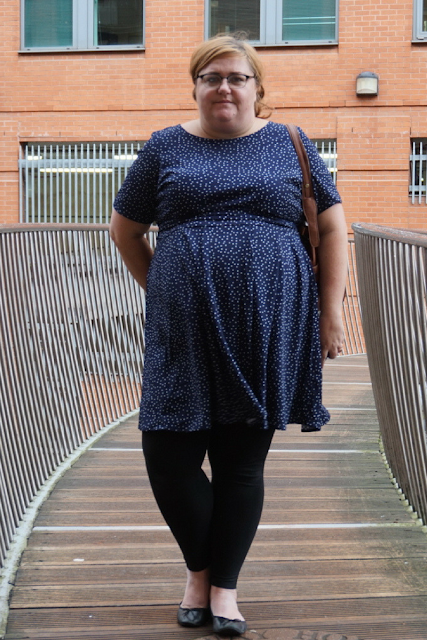 I think this dress is going to be an Autumn and Winter staple and I've already worn it since our team night out and I'm planning to wear it when I go to the Christmas markets with my long boots and winter coat. Thank you to House of Fraser for providing the dress free of charge for review purposes and as always my options of this item are my own. Spots are such a classic look, have a great festive period! Love the spots and the sleeves. It is my kind of dress, I may have a look when I am in there! I've recently bought a jumper dress for the first time and seriously can not take it off. It is like a giant cuddle!! Great looking dress. Its definately hard going from office to party - I usually end up taking a party dress with me to work and getting changed in the toilets! Oh that's a cute spotty number - love it!